I know this is about four days late, but it's something that I feel strongly about. This hit on Ryan Kesler on Mikael Granlund with .02 seconds left in the game is unnecessary. Second, Kesler is one of the biggest frauds to play the game of hockey. He dives and embellished up and down the ice. That in my opinion cheapens the game of hockey and is poor sportsmanship. This is also the reason why I don't like the rule that prohibits fights after five-minute minute mark of the third period. This rule gives players the ability to run around the ice and take runs at other players, without fear of retribution. With that bush league move, Kesler should earn himself a beat down the next time the Wild play the Ducks. Michael Russo thought that the Ducks were taking runs at the Wild in the second and third periods. The Ducks, getting dominated like Boudreau asserted, definitely tried to go after the Wild’s lesser players physically in the second and third periods. Ryan Getzlaf went after Jonas Brodin all game, and once Coyle jumped to Brodin’s defense. Astonishingly, referee Eric Furlatt gave Coyle four minutes and Getzlaf two (nothing for two cross checks on Brodin) and no extras for Anaheim even though both Getzlaf and Matt Beleskey removed their gloves to fight. The ignored calls on Anaheim and the fact the Wild wound up on the PK turned the momentum bigtime for several minutes here. The Wild still escaped though. Again, the Wild seem to run into the refs that are having bad performances on the nights the Wild are playing. That's fine, maybe the Wild should start taking runs at the other teams star players if this behavior continues. What a save by former Wisconsin Badgers and current St. Louis Blues goalie Brian Elliot as he absolutely robs Minnesota Wild forward Mikael Granlund Difference in the game, maybe. The Wild would lose in a shootout as T.J. Oshie got the game winning shootout goal. You have to watch out for the Injury Ninja. According to Pro Sports Daily, Mikael Granlund is out with a concussion after missing two-games due to another injury. Granlund’s game lasted a whole 29-seconds. Pro Sports Daily -- "I feel horrible for him," Zucker said. "It's a battle, and I hope he gets better soon and can figure it out quickly, because that's not something anyone wants to see happen to anybody. "Coach Mike Yeo termed it an upper body injury but said it has been nagging for at least the past three games. Granlund was cleared to play Wednesday for the first time in a week, but it came with a warning. "He was cleared to play with the idea that we wanted to be careful and think about the big picture," Yeo said. "Sometimes things happen. "Yeo didn't want to look ahead to next week, when Granlund will be eligible to come off injured reserve.He said the team has been looking daily for too long at whether Granlund would play, so now they want to give him some time off. According to Michael Russo, Minnesota Wild forward Mikael Granlund has been put on the injured reserve and is expected to miss about three games, probably more. This isn't good news for the Minnesota Wild. First, I was out of town and away from the computer, but this hit did get my ire. I don't like this hit one bit, it's a dangerous hit and it's unneeded. In my opinion, the headline should read, Maple Leafs' forward Kadri suspended five games for bush league hits. Second, why isn't there any supplemental discipline for the hit on Minnesota Wild forward Mikael Granlund? That's a dirty hit in my opinion as well. I don't know, maybe I am not looking at this objectively because I am Wild fan? Thoughts on this? Nazem Kadri's hit on Niklas Backstrom is a chicken wing elbow. Anytime a player extends the elbow like this, it's intentional. I don't care what the players says at his hearing. The NHL has suspended Nazem Kadri three-games for his elbow on Backstrom. Also, watch the suspension video, it's utter crap. I would use another word, but it's now a word that is used on this blog. While the game didn't go the way that Wild fans would have wanted, Zach Parise (2g-1a-3—pts), Mikko Koivu (1g-1a—2pts) and Dany Heatley (1g-1a—2pts) all had a pretty good night and scored all four of the Wild goals. The Blues would win the game in overtime with a goal from former Boston Bruins forward Vladimir Sobotka. I have been trying to make heads or tails of the new CBA proposal by the NHL owners and let me just say that I have a bad feeling that it could be a long drawn out fight. We should be very worried about the NHL season starting on time – my gut feeling – I am going to predict that the season is delayed until at least November or December. Jonathan Willis, edmontonjournal.com --- If the NHL gets its way on some of its demands – particularly it’s insistence that players sign five-year deals capped at the rookie maximum – that trickle will expand. To use an Oilers’ example, why would Nail Yakupov be willing to sign for five years on a contract with a base salary of less than $1 million when he could expect to make much more money much sooner in Russia? Particularly if, upon the completion of his five-year entry-level NHL deal, he could look forward to five more years of restricted free agency? Even if he were willing to do so, it seems likely that future drafts would see European players increasingly consider the Kontinental Hockey League as a viable option. Another interesting wrinkle is the NHL/KHL memorandum of understanding. As things stand, the KHL respects NHL contracts, not poaching talent on deals, and the NHL does likewise. If, however, the NHL starts kneecapping its teams’ ability to compete financially with the KHL, the incentive of the Russian league to respect NHL rules would undoubtedly be greatly reduced. The possibility exists that the league owners don’t care. What they’re asking for is a huge spike in the amount of money they get to take home, massive restrictions on the negotiating power of individual players, and a much longer time period before talented youngsters start earning big money. With the possibility of huge spikes in take-home money and greater certainty that drafted players will stay in the system for the long haul, an exodus of European talent back to Europe may not bother them in the least. Initially; after perusing some of the proposals that the owners put forth – I decided that I don’t like the idea of extending entry level deals from three to five years. Why? There is no reason to do that. A player after playing in the NHL for three season should have the ability to get a substantial raise if he has been successful. All that is going to do is steer top European players to the KHL instead of the NHL. I wonder if the Minnesota Wild would miss out on a player like Mikael Granlund? Also, I don’t think the players are going to take a big cut in pay from the owners especially after some of the ridiculous free agent contracts that have been signed this free agent signing period. Donald Fehr is on record as saying that player’s roll backs are not going to happen on his watch. Just for comparison purposes the NFL and NBA players are making 47 and 50 percent of their leagues revenues. So it will be interesting to see what the NHL players agree to, I wonder if they would go very far below 50 percent. Based on the fact that the NHL made 3.3 billion last season – I don’t have a lot of empathy for the owners. I also think that you might want to plan to do something else during the months of October and November – don’t plan on watching the NHL – because this disagreement is going to take a while if the owners don’t come down off their high horse. Duh! I wonder if Sid has even been to a hockey game lately? I always get a kick out of Sid Hartman's writings - although hockey has never been a strong subject for Sid. Of course Parise would look better along side Mikael Granlund and or Mikko Koivu for that matter. There are probably 25-29 teams that are interested in the services of Zach Parise. Sid Hartman, Star Tribune --- Lou Nanne, whom I describe as Mr. Hockey in this state, has been a close friend of J.P. Parise (Zach's father and a former Minnesota North Star) for a long, long time, and he has been a confidant of young Parise since the young man hung around local NHL teams. Nanne is convinced that the Wild would have a good chance of signing Parise if New Jersey is fortunate enough to win the Stanley Cup -- they have a 3-2 lead on the Rangers in the Eastern Conference finals. Parise has been great for New Jersey in the playoffs, with 14 points in 17 games on seven goals and seven assists. "If Jersey does win, it could really benefit the Wild because Zach Parise is a free agent and he wants to win a Cup," Nanne said. "It might be tough for him to come here right away, but if he wins a Cup in New Jersey then that goal has already been met and then it might be really reasonable for him to come to the Wild as a free agent." Nanne said Parise hasn't ruled out signing with anyone. Michael Russo of the Star Tribune was on KFAN with Paul Allen last week talking about the Wild signing Mikael Granlaund. Russo informed Allen that as soon as the World Championship was over, the Minnesota Wild would sign the young star. That wait is now over and the Wild now have their top prospect signed up and ready to go. This is the latest highlight in the career of Wild super prospect Mikael Granlund, this time it's another shootout goal from last weekend. I must say that this goal doesn't require a lot of narration but damn this kid is good and shows us a glimpse of the things to come... Seriously? I can't believe that he isn't ready to play for the Minnesota Wild this season. Maybe someone please tell me the logic why Wild prospect Mikael Granlund isn't going to be playing for the Wild this season? This is Minnesota Wild prospect Mikael Granlund's goal during the shootout of Saturday's scrimmage during Development Camp. Remind me why he isn't going to be playing for the Minnesota Wild this season, this kid is the real deal. I can't wait till he is playing for the Minnesota Wild. 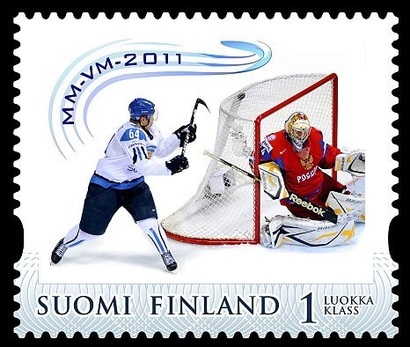 S/T Hockey Wilderness... Wild Prospect Mikael Granlund now has his own stamp in his native country of Finland. Granlund became even more famous after his impressive lacross style goal against Russia in the World Hockey Championship earlier this month. According to Star Tribune beat writer Michael Russo the Minnesota Wild's top prospect Mikael Granlund will be staying in Finland this year and not coming to North America to play. This is going to be a disappointment to many Wild fans because the Wild are starved for offense and this kid is proving to be the real deal which is evident from his lacrosse style goal in the video above. Michael Russo; Star Tribune ---Despite Mikko Koivu's attempt to persuade him to play for the Wild next season, highly touted 19-year-old Mikael Granlund will remain in Finland another year, one of his representatives said Thursday. "The game plan is he's going to be entering the army and fulfilling his service and finishing high school, and we'd come over a year from now," agent Todd Diamond said. "Mikael prefers when he comes over to Minnesota, hockey is the only thing he needs to focus on in his life. He wants to get all these so-called housekeeping things out of the way and, a year from now, get ready to hopefully crack the lineup." Diamond said Granlund has received permission from the Finnish Army to attend the Wild's July 10-17 development camp. Diamond said the plan is to sign "this time next year." "We believe Minnesota is a really good spot for him and the right environment for him to succeed in the future. It's the Finland of the United States in some ways," Diamond said. Granlund, the Wild's first-round draft pick in 2010, helped lead HIFK to an SM-Liiga championship, then Finland to a world championship. This is an amazing goal by Mikael Granlund it's simply one of the best of the year. I am not sure I can do Grandlund's goal justice by trying to describe it. I hope the Wild get him in a uniform next season right away because this kid is the real deal. Granlund was big for team Finland during the IIHF World Championship.Granlund is 9th in scoring with (2g-6a-8pts) in 8 games for team Finland.